(Nanowerk News) An outstanding challenge in nanotechnology is to find a simple way to precisely fabricate three-dimensional (3D) nanostructures. In common industrial-scale nanotechnology, required structures are typically defined by a mask that has a planar geometry as it is imaged onto a wafer. The mask is then used to sculpt the structure by etching. Since modern integrated circuits or chips consist of many layers, all layers must be painstakingly aligned and stacked in a so-called layer-by-layer approach. 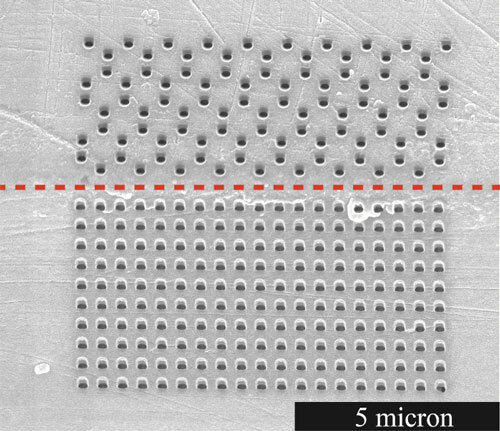 Recently, scientists from the MESA+ Institute for Nanotechnology at the University of Twente in the Netherlands have proposed a creative approach to define 3D nanostructure ("Method for making a single-step etch mask for 3D monolithic nanostructures"). In their approach, they realize 3D structures in one step by intersecting two perpendicularly aligned two-dimensional structures. The two-dimensional structures are defined by a 3D etch mask that is projected in one step on the edge of a silicon wafer. Consequently, the two two-dimensional patterns are by design in perfect alignment. Subsequently, the 3D nanostructure is realized by etching through the 3D mask. 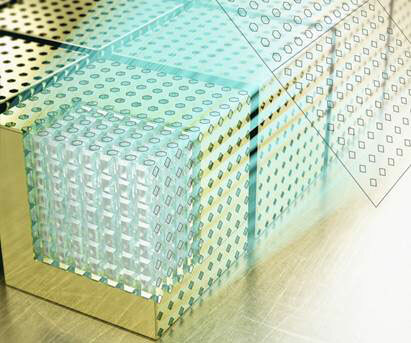 The team has demonstrated their method by fabricating 3D diamond-structured photonic band gap crystals, with an alignment between the two-dimensional patterns of better than 3 nm. Figure 1. Artistic representation of a novel single step mask approach for 3D nanofabrication. Two perpendicular surfaces are covered with mask material. The design pattern consists of array of hexagons intended for the upper surface and array of diamonds intended for a lower surface. Both surfaces are patterned in a single step therefore their mutual alignment is ensured. Further on, structure is etched through the mask in a bulk of material. They illustrate the flexibility of their method by fabricating masks for a hexagonal crystal structure, and for a cubic structure with an array of point defects that will act as an array of resonating cavities. The world around us is three-dimensional and that is what makes it so unique and diverse. A great variety of peculiar phenomena occur only in three-dimensional (3D) structures. Among them are intriguing crystal with a photonic band gap that allow us to ultimately control light at the nanoscale. Besides curiosity-driven questions many applications can be found for 3D nanostructures: A modern silicon chips in a mobile phone or a laptop has an intricate 3D structure. One of the most widely-used 3D nanofabrication method, known as CMOS fabrication, involves the stacking of multiple planar layers on top of each other. Each layer is fabricated in a planar way, as dictated by currently available technology. Such approach requires the alignment of each layer to all previous ones below, so-called overlay. Overlay is a limiting quality factor and is therefore of crucial interest for every chip. Figure 2. A mask created in a single step to realize a hexagonal 3D crystal in silicon. The top part shows a graphene-like hexagonal pattern that is located on one wafer surface. The bottom part shows a rectangular pattern located on the perpendicular wafer surface. 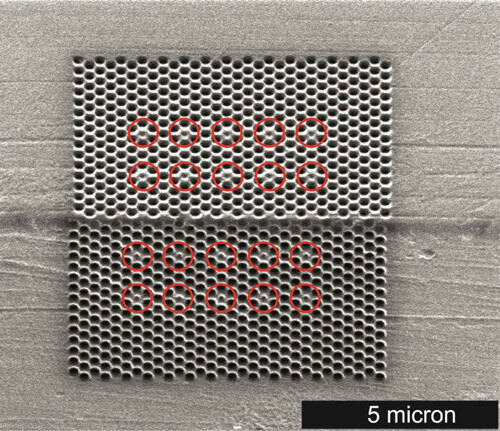 The two patterns are aligned (left-right) to within 3 nm. In addition, it is physically inevitable that after stacking a large number of layers, subsequent layers are not structurally related anymore to the ones lower down. Thus, while 3D nanofabrication has attracted the attention of scientists for decades, it still remains a challenge to fabricate true 3D structures, especially using industrial CMOS compatible techniques. Scientists from the University of Twente present an original way to fabricate 3D nanostructures. Their approach ensures the alignment at the design state of the structure and therefore avoids the overlay issues. The fabrication starts on a non-planar substrate consisting of two oblique surfaces. An example is the edge of a standard silicon wafer. The oblique surfaces are covered with a material that will act as a hard mask for sculpting the material, such as chromium metal. The Twente scientists have managed to tilt the substrate in such a way that it is possible to reach both inclined surfaces simultaneously as shown in Fig. 1. Thus, the design pattern consists of two parts: pattern of hexagons is intended for the upper surface and pattern of diamonds is intended for the lower surface. Since the patterns for both surfaces are contained in one projection, their mutual alignment is ensured. In their paper the authors show an alignment better than 3.0 nm between the patterns in different dimensions. After the hard mask is created (see Fig. 2), the 3D structures are realized by etching in the bulk of the material through this mask with an etching gas in a reactor. An advantageous feature of the proposed method is that there are no limitations on the pattern design. Moreover, the features on oblique surfaces can be of any shape in any arrangement, while still being in perfect alignment. Figure 3. A mask created to realise an array of cavities in 3D photonic crystal. The red circles point out embedded defects into a perfect crystal ? pores with a smaller radius. As an example of a 3D nanostructure fabricated with the new method the scientists have realized perfectly aligned 3D photonic crystal structures made in silicon. The Twente scientists have also managed to embed a controlled point defect into 3D photonic crystal ? a so-called cavity and even array of cavities. Cavities inside 3D photonic crystals serve to trap light in a tiny volume and therefore make photonic crystal functional, similar to the defects in a semiconductor. By expanding their method, the scientists have even managed to realize an array of many cavities, that is intended to Anderson localize the light. To demonstrate the flexibility of their new method the scientists have also realized a mask that yields a curious 3D hexagonal structure in bulk silicon. Previously, fabrication of such geometries required a very complex alignment procedure but now it is possible to prepare a mask for fabrication in a single step. Due to its simplicity and flexibility the new method is expected to stimulate multiple research avenues in the area of 3D nanostructures. Especially exciting possibilities are opened up for multidisciplinary fields such as optofluidics, optoelectronics, integrated photonics. By projecting different components in a single step on a perpendicular surfaces it is possible to have them communicate with a perfect alignment, yet still spatially separated. Building 3D nanostructures on chip brings intriguing new opportunities for integration of photonics and electronics along with increase of components density on chip. This work of Dutch scientists has been accepted for a publication in a world known scientific journal ?Nanotechnology? and will be available with an open access.